Dandelion is a flowering plant that grows in North America, Europe and parts of Asia. While it is considered as a weed in any garden, its roots are extremely beneficial. The dandelion plants have tap roots which can be uprooted, cleaned and used to make Dandelion root tea. The roots resemble small carrots or radishes. The root is traditionally roasted and powdered and used to make tea. Nowadays, you can find Dandelion Root Tea in the stores in the form of tea powder or tea bags. How to make Dandelion Root Tea? If using dandelion roots, then uproot mature roots and clean them. Leave them to dry. Chop them into pieces, roast and then grind them. Next, steep it in hot, boiling water for about 8 minutes. Strain and enjoy the earthy and nutty flavored tea. If using a tea bag, brew your tea as per the pack instructions. Aids Digestion- Dandelion root acts as a mild laxative and helps relieve any indigestion issues. Drink it on empty stomach, first thing in the morning for best results. Not just that, dandelion root tea almost doubles the bile output of the body. The bile is what helps in digestion and absorption of fats and emulsification of food. Helps the kidney- The tea made of dandelion roots acts as a diuretic – it promotes urination. It assists the kidney in flushing out toxins from the body, along with retained water and salts. Helps prevent bloating- Since Dandelion root is a diuretic, drinking it will give you relief from water retention and bloating. Helps the Liver- It helps the liver flush out toxins and improves bile production in the liver. It also maintains the electrolyte balance in the liver. 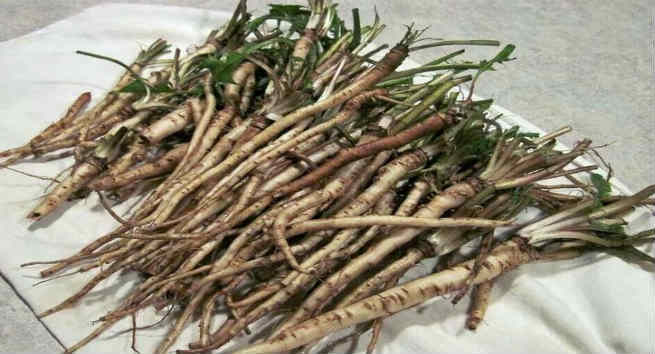 In fact, liver cleansing is one of the main reasons for the popularity of Dandelion Roots. Many go on a liver cleanse wherein they consume 3-4 cups of dandelion root tea for a week with the aim of cleansing the liver, especially after an alcohol binge. Lowers Blood Pressure- By increasing urination and getting rid of excess salt from the body, dandelion root automatically reduces blood pressure. Helps cure urinary tract infections- Dandelion root tea, when consumed with another herb called uva ursi helps in ridding urinary tract infections. Hormonal Balance- The Taraxasterol and taraxerol compounds in dandelion roots help in stabilizing any hormonal imbalances in the body. Drinking two cups of dandelion root tea every day helps keep your hormonal imbalance in check. Treats Osteoporosis- Drinking two cups of dandelion root tea everyday can help increase the bone density in the body. Prevents Cancer- While there is yet no solid proof for the same, it is said that drinking dandelion root tea helps keep cancer at bay, since it cleanses most parts of our body. Inflammation- Drinking Dandelion root tea is said to reduce any kind of swelling or inflammation because it is rich in phytonutrients and essential fatty acids. It is hence prescribed for people suffering from joint pains. It can also be directly applied on the skin if you suffer from eczema. With so many health benefits to it, you should give the Dandelion Tea a try. While it does not have any side effects, make sure that you are not allergic to it. Also ensure that you use organic dandelions and not the ones sprayed with pesticides.